Lock in a great price for Promenáda Romantic Hotel – rated 9.2 by recent guests! The staff were super wonderful! We had a heck of a time trying to drive in. We parked and walked to the hotel; one of the staff walked with my husband back to the car to get it and our luggage to the hotel!!! Super grateful for that!!! Room was cozy and warm. 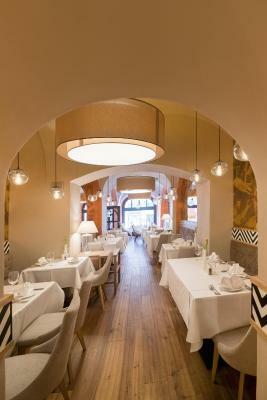 The restaurant was recommended by a local who works at another hotel. Of course we ate at the hotel and savored every delicious bite! 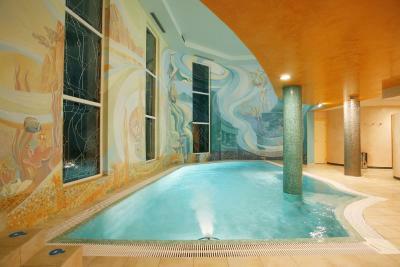 Very nice, family run Spa - Wellness Hotel. Impeccable service, very helpful staff. Great breakfast, top notch restaurant for an upscale dinner. Very centrally located. My wife loved the pampering spa treatment, while i enjoyed the sauna and the pool. Not cheap, but well worth the money. 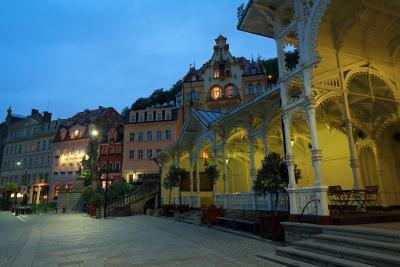 Karlovy Vary is a sparkling Spa town! 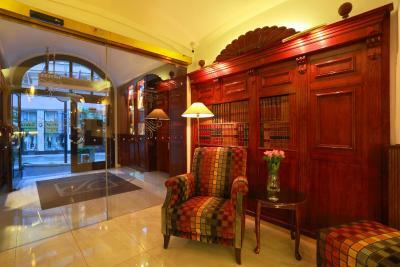 Friendly staff, valet parking, excellent accommodations, comfortable bed, close to all attractions. I highly recommend the restaurant in the hotel...the food was fabulous! Excellent staff - very friendly and helpful! 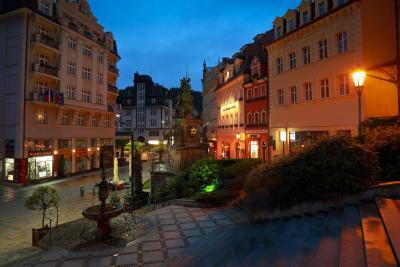 Very clean and well organized hotel at a top location in Karlovy Vary. 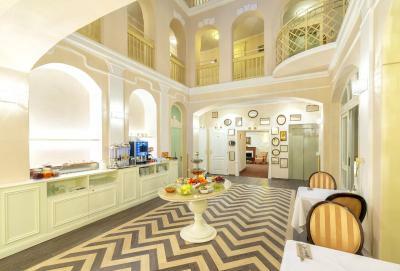 Comfortable beds and a decent breakfast, plus good Wifi! Friendliness and support from the staff. Location is escellent. 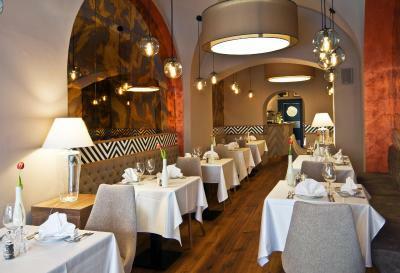 The hotel restaurant is one of the best in the city (although quite expensive). Very good location, could walk everywhere. Room and bathroom were clean and well organised. Very helpful welcoming person on reception. Valet parking. 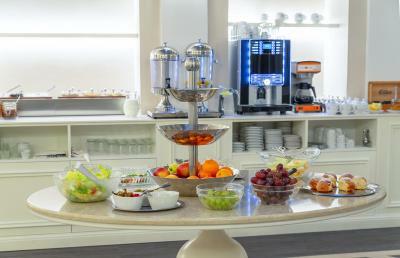 Great breakfast, extremely friendly stuff, clean rooms and facilities. perfect location in the exact centre of town. Staff was very friendly and knowledgable. they went out of their way to accomodate(early breakfast,bringing the car around etc). The room was huge,clean and everything in working order. 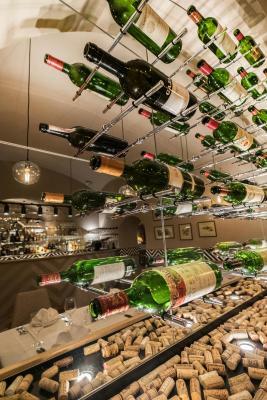 There is nothing bad to say about the hotel and the adjacent restaurant is absolutly fantastic-excellent food and servuce! Good location and the restaurant is very very good. 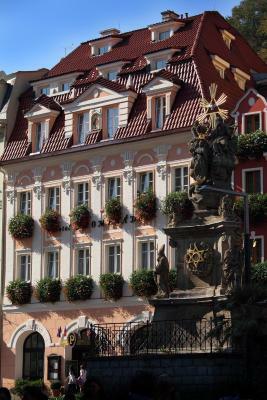 Promenáda Romantic Hotel This rating is a reflection of how the property compares to the industry standard when it comes to price, facilities and services available. It's based on a self-evaluation by the property. Use this rating to help choose your stay! 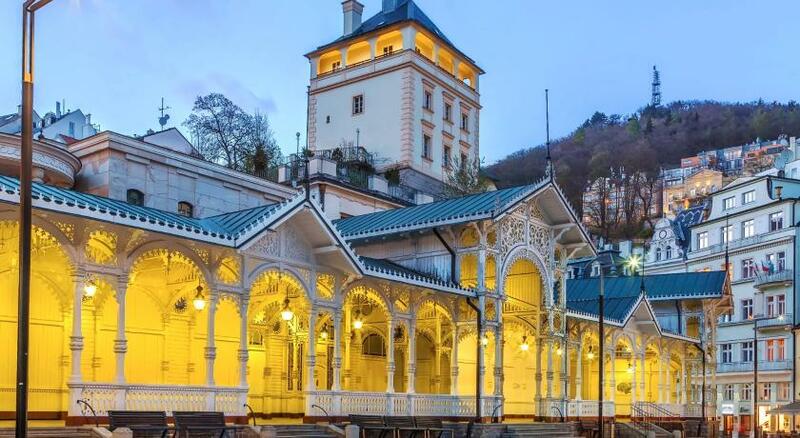 One of our top picks in Karlovy Vary.Located in the heart of Karlovy Vary's spa area next to healing springs, right next to the Tržní Colonnade and steps away from the Hot Spring, Hotel Promenada features its own spa area with an indoor pool. 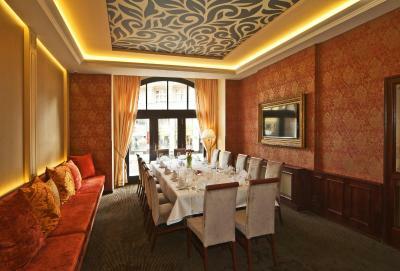 Guests can dine in an award-winning à-la-carte restaurant and unwind in a bar. Free WiFi is available in the rooms. Occupying 2 renovated buildings from the 16th and 17th centuries, the Promenada features a private underground car park. 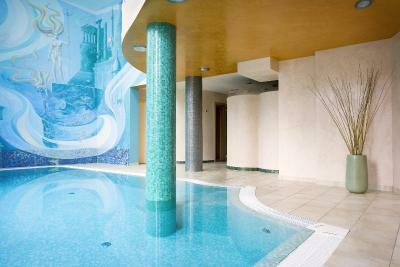 Access to the indoor pool and the sauna is free. Guests can also enjoy a variety of massages, torf packs, herbal baths or special relaxation packages. 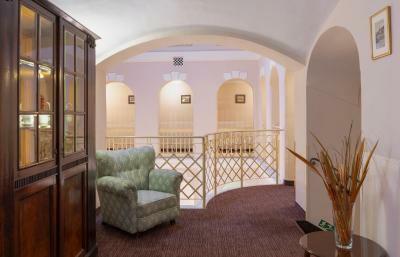 All spacious rooms include a flat-screen TV with satellite channels, a safety deposit box, a mini-bar, and a bathroom fitted with a hairdryer and a bath or a shower. Guests are also provided with slippers and bathrobes. 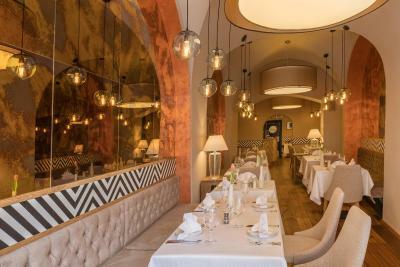 In the prestigious annual contest TOP 100 awards for 2017, the Promenada Hotel's restaurant was named the best restaurant in Karlovy Vary and one of top 10 restaurants in the Czech Republic. 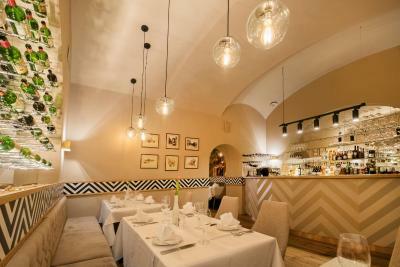 The restaurant was visited by famous movie stars such as Richard Gere, Antonio Banderas, Jude Law or Robert de Niro. 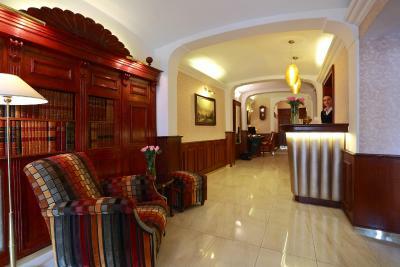 When would you like to stay at Promenáda Romantic Hotel? This room includes a private bathroom and a sitting area with a flat-screen satellite TV and a minibar. 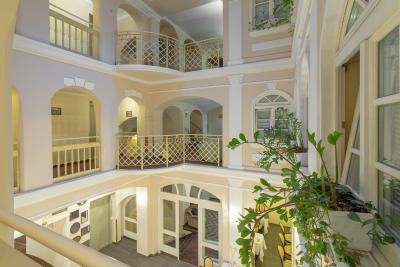 This very large apartment consists of 2 floors and features a terrace. The ground floor consists of a large living room. The 2 bedrooms are upstairs, each with a separate bathroom. This spacious duplex unit features a terrace. There is a living room and a bedroom downstairs, and 2 bedrooms on the upper floor, each with a separate bathroom. 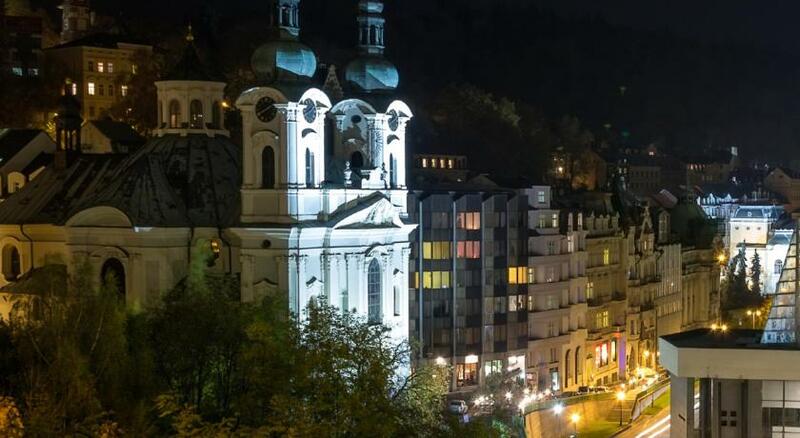 The Hotel Promenáda Karlovy Vary an unique experience, quality and kindness and, in addition to it, a kind of nobility without formal etiquette this all is our aim.Part of the hotel is the Wellness Club and an underground car park. 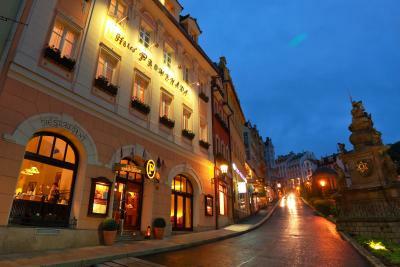 House Rules Promenáda Romantic Hotel takes special requests – add in the next step! 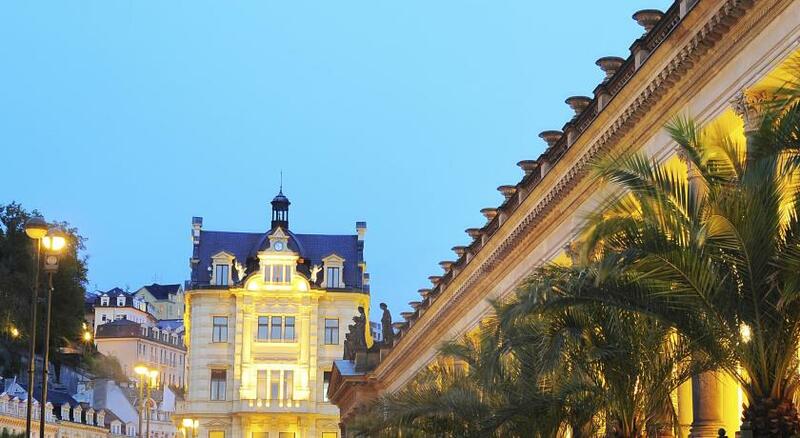 Promenáda Romantic Hotel accepts these cards and reserves the right to temporarily hold an amount prior to arrival. Please note that children under 3 years can stay free of charge if sleeping in existing beds. Older children can stay in an extra bed available for a surcharge. 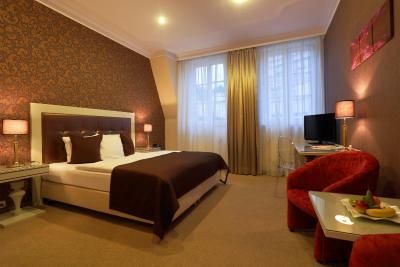 All rooms include 2 twin beds which can be connected and used as a double bed. The spa and fitness area was okay but it felt somewhat disappointing for the price being paid. The hotel room was very big for two adults. 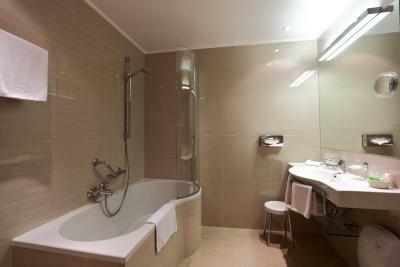 Ideally, a bath should have been put into the bathroom and the actual room made slightly smaller. 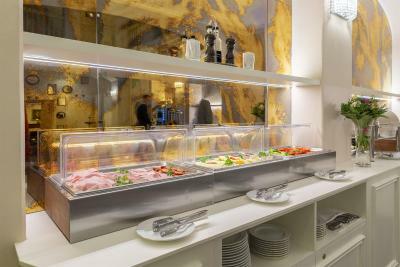 No lobby , and restaurant on site was for another party that eliminates the lobby services completely during lunch and from 18:00 hours to sleeping time. They need to work in their breakfast quality. 1. Breakfast was light on variety, and often light on quantity. 2. Small swimming pool. 3. Generally felt it was overpriced. 1. Location. 2. Apartment was ideal for 7 people. The swimming pool is too small. Room is a bit out fashioned. Food selection at breakfast could have been greater. The swimming pool required a short walk outside to a building at the back off the hotel.